In this adorable book, we find a monkey named Emily who sleeps in a frilly French bedroom. She is rather mischievous and loves to swing from chandeliers, paint pictures on walls and hide. On these pages she is found on almost every page, sometimes she is hiding between books on a shelf or playing the piano. Sharon Watts has done an amazing job with the illustrations. This book has an added level of intrigue as some of the pages fold out. There is a lot going on behind the green curtain! The words within the pictures are often in full-color and I found the main story font was easy to read. In this story, Madame DuBois takes care of Emily as if she was her child. We find Emily eating in bed or being carried home from a shopping trip. She also enjoys taking Emily to outdoor markets where she eats famous French doughnuts. Madame DuBois also makes sure she wears fashionable clothes. 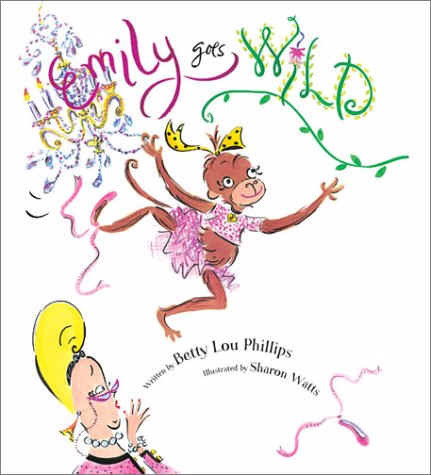 One day, Emily goes wild and Madame DuBois takes her to the Zoo so she can be with other monkeys. She soon regrets this decision, but with some patience she learns this is best for a wild animal. This book is filled with wonderful art, some suspense and even a good laugh on the last page. Your young children will love this book.